Note Editor's T his is the season of gi giving. e top 10 consumer gis are mostly technology- enabled and give us insights into the technologies corporate learning needs to em- brace. From Apple Watch, Playstation VR, Amazon's Echo Dot to Fire TV Stick, we see trends in mobile, virtual reality, machine learning, artificial intelligence and video streaming. e rate of technology adoption is pressuring learning organizations to adopt and adapt quickly. Inside this issue, we share how talent leaders are adopting these technologies. >> Virtual reality is expected to reach $50 billion by 2020, according to Goldman Sachs. We asked four leaders from education, government and corporate enterprises to share how they are using VR for learning (page 18). >> e user experience is paramount to employees as seen in the HR Trends of 2017 and Learning! 100 Express articles (pages 22 and 26). With the increase of millennials in the workplace, learning lead- ers are embracing social, video and mobile to enhance user experience and engagement. 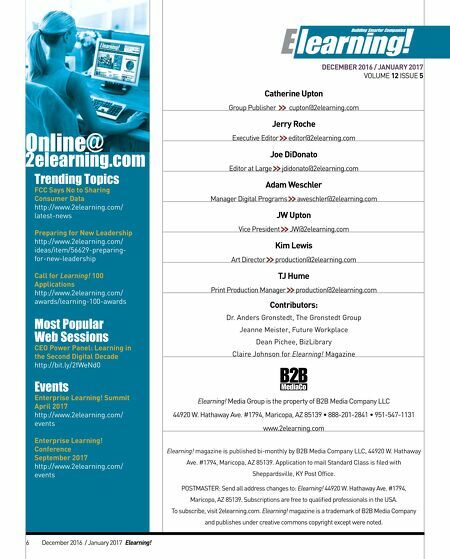 >> e 12th Annual Best of Elearning! Awards honors 99 solution providers nominated by more than 4,000 learning professionals. is article shares what enterprises are investing in and deploying suc- cessfully. See the complete list of solutions and what users say about them starting on page 31. While technology may be a portion of the story, there are also key behavioral shis. David Coleman shares his insights on the emergence of the fractal organization, a flat collaborative work structure that may be in your future (page 13). Jeanne Meister declares we are in the "Era of the Serial Learner" and what it means to leaders everywhere (page 12). Finally, Dean Pichee shares "Organizations who deliver the best, most engaging, effective employee training today are going to be tomorrow's winners in the marketplace." Learn more in his "Science of Learning" column on page 16. It's time to make that next transition. Take the first step by reading these articles from learning lead- ers who have been in your shoes. Create your corporate learning wish list with an eye on your future workforce, their behaviors and toolsets. And let's keep on learning! Happy Holidays from the Elearning! magazine team. —Catherine Upton, Group Publisher Elearning! 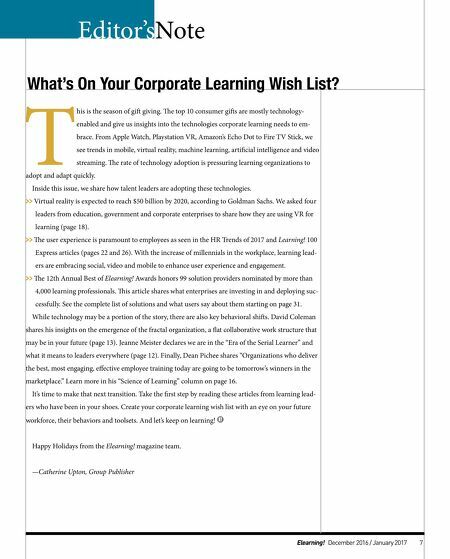 December 2016 / January 2017 7 What's On Your Corporate Learning Wish List?